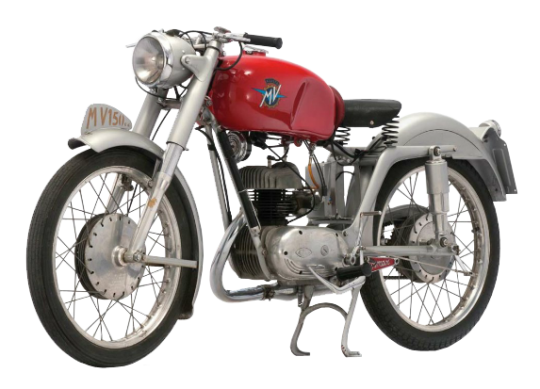 In 1950, the new MV Agusta 150 was produced in the Turismo and Sport versions. The 150 Sport was the entry-level bike, and was rated for 6 HP, giving the machine a top speed of 90 kph. Carburation was dellorto, while the electric system used Marelli components. Because of the lower power relative to upper-range 150’s the Sport’s brakes were smaller; both front and rear alloy drums measered 123,5 mm. The frame was a combination of tubular and pressed steel, and the engine was used as a structural member. The front suspension was a telescopic fork, while the rear suspensionutulized a swingarm with hydraulic shock absorbers.